Holiday Marketing Do’s & Don’ts: Are Your SEO Tactics Naughty or Nice? Home » Blog » Holiday Marketing Do’s and Don’ts: Are Your Favorite SEO Tactics Naughty or Nice? 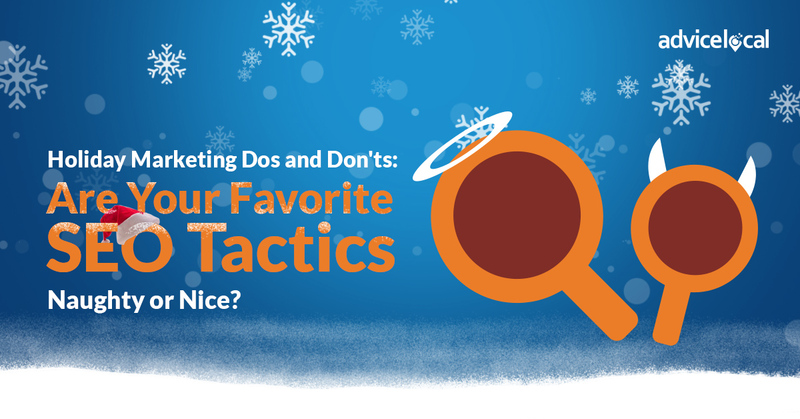 Holiday Marketing Do’s and Don’ts: Are Your Favorite SEO Tactics Naughty or Nice? The simple fact is we all want to make Google happy. With search engines continuously updating their algorithms and preferences, this can be a challenge. As these updates occur, so do changes in what defines good and bad SEO tactics. Keep reading to find out if your go-to SEO tactics are enough to keep you on Google’s ‘nice list’ this season. SEO Do’s and Don’ts: Is Your Business on Google’s Nice List? Now that search engines are better at determining the quality and value of websites, Google rewards content written for real people. Content awkwardly stuffed with keywords is no longer in the top of SERPs (or, at least, it shouldn’t be). We know this because Google shared, in great detail, their guidelines on the importance of Expert, Authoritative, and Trustworthy (E-A-T) content. Keywords are still important for SEO, but search engines are more impressed by writing that reads naturally and doesn’t feel optimized. The solution? Write for humans first, and then optimize the content by inserting keywords where it’s natural to do so. This one is two-fold. Leveraging services such as Advice Local’s to create mentions of a business through directory sites and encouraging customer reviews is a win-win for local businesses. The more mentions a business has online, the higher they can rank in local search results. However, if those mentions contain inaccurate NAP (name, address, phone number) data, it can do more harm than good for a business’s local presence. Prominence also comes into play here. This impacts local businesses that are popular but don’t specifically manage their online presence, such as small mom-and-pop stores. Customers talk about these businesses online because they love them, and they can place higher in search results than competitors that have lots of bad data and reviews to go with it. Businesses that optimize their websites for desktop users may think they’re on the right track, but their placement in search will suffer if the site is difficult to load, navigate, or find on a mobile device. Google’s mobile index will continue to become more authoritative than the desktop index – meaning mobile-friendly sites get a huge boost in visibility, even if they’re optimized for mobile over desktop. Remember, 91% of people consult their phone to search for product information, alternative prices, and other decision-supporting data before making a purchase – these are called micro-moments. Creating a blog and posting new content on a regular basis can do wonders for a business’s SEO, not to its mention brand image and credibility. However, since many businesses don’t have the resources to create new content every single day, it’s best to focus on publishing consistently rather than daily. If you’re lacking inspiration for original content, look back at some of your older blog pieces. Of course, it’s bad form to publish duplicate content, but repurposing and updating existing blog content is a resourceful way to expand a business’s online presence. That is, as long as the content is properly recycled (not replicated!) and updated to reflect any industry changes. This SEO tactic is certainly naughty when linking to external sites with low levels of authority. Businesses should only link outbound when it makes sense. For example, linking to a site that expands on a topic you are writing about in greater detail is a good practice. On the other hand, linking out to a site just for the sake of linking or to garner attention from that site is a naughty practice. A better option is to include internal links that keep visitors on the business’s website and provide more context to the reader. Businesses can stay on Google’s nice list by employing no-follow links when linking out from within sponsored content and when using affiliate links. Targeting Local Customers – Nice! A website that features local-focused blog content or landing pages specifically directed at local customers is making the job of search engines much easier. When they can immediately identify the target audience and why a reader would be interested in the content, search engines recognize that the site has value and are more likely to serve it up to local consumers in search results. Create SEO-optimized landing pages for each store location so Google knows exactly what information to show to local searchers. What are your favorite holiday marketing and SEO tactics? More importantly, do they land the business you represent on Google’s naughty or nice list? Be sure to come back for more local SEO tips from the #QueenofLocalSEO next week.